Aztec slots have been done time and time again, so when we play one we can’t help but go in thinking we’ve seen this all before. 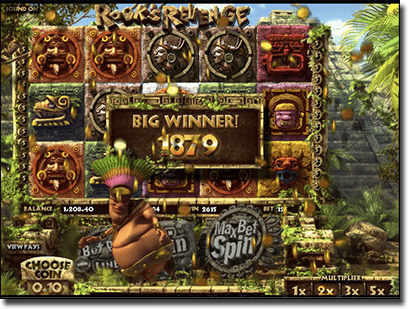 But BetSoft Gaming have re-interpreted the theme featuring the ancient Mayans, by including the hilarious main character Rook – a chieftain who dances around the reels on a win – and even does the worm. This slot is actually a sequel to Aztec Treasures, a Mayan themed slot by BetSoft, that isn’t nearly as visually appealing. We are once again set in the Ancient civilisation of South America, but this time we follow the hilarious, and quite chubby, character Rook. There’s quite a lot going on on the 5 reels that offers 25 paylines, but BetSoft make sure every image is as detailed as possible, all the while still managing to make it look like it all blends in – something BetSoft are quite good at. Rook wants revenge, for what we aren’t quite clear, but we will roll with it to determine if this is a top slot from the 3D slot pioneers. There is quite a boisterous soundtrack, that sounds like Las Vegas went to the jungle, but you can mute this if it becomes too much via the game’s settings. There aren’t many features to Rook’s Revenge, but the ones included could see your bank balance increase quickly. Cascading Wins with multiplier: We have seen this magnificent feature before, and we welcome it with open arms here. Every time a winning combination is landed, the winning symbols/blocks explode. New blocks/symbols then fall into place to allow for another chance at a win – giving us almost a free re-spin. What’s more is every time you do win here, the multiplier progress bar increases from 1x, to 2x, then to 3x, and finally to 5x, as long as the wins are consecutive. Free spins: Free spins are always a welcome addition and if you land at least three Scatter symbols you will activate 10 free spins, as well as up to a 15x multiplier. Every symbol on the reels are Ancient Mayan symbols engraved into the blocks/reels so it can be quite hard to distinguish which are the higher paying symbols, and which are the lower ones. However, as per the paytable, the lowest paying symbol is the brown Mayan block, while the highest is the red. Wild symbol: The Wild symbol is the gold Mayan block with the question mark in the centre. It only appears on reels 2, 3, and 4, but substitutes for all symbols to create a winning combination. Scatter symbol: Not technically referred to as the Scatter symbol by BetSoft here, but performs the same action as one, is the golden mask symbol. They only appear on reels 1, 2, and 3, but activate the Free Spins mode if you score at least three – though they have to be involved in a winning combination too. This slot reminds us of Gonzo’s Quest by NetEnt, with the Cascading Wins and increasing multipliers – which is a good thing. We aren’t sure how we feel regarding the fact that there aren’t many bonus features included, and instead of making it incredibly easy to score the only ones on offer they’ve limited the Scatter symbol to just the first three reels, and the Wild to the middle three reels. However, the fact you can win big, and quite regularly at that, makes up for this and this is due to the exploding symbols. We didn’t even think about activating the Free Spins feature because we were so busy winning big in the base game, but now that we look at it, it was nearly impossible to activate the feature and we didn’t manage to do so in the couple of hours we were playing. 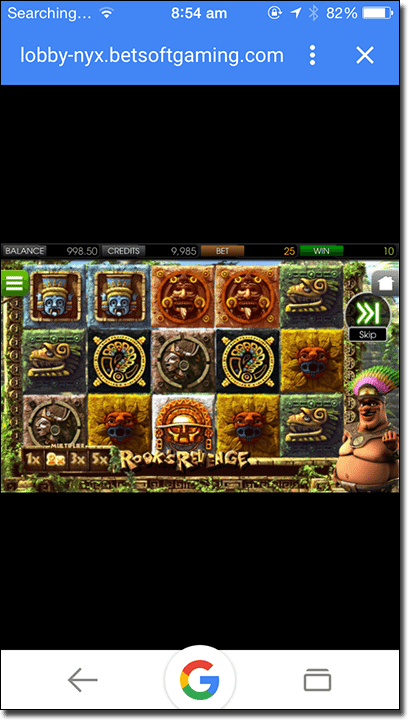 We do have to say BetSoft has done a great job setting yet another Aztec slot apart from all of the other Mayan themed pokies, and the Cascading Wins feature definitely makes up for the lack of other features. As one of the most popular titles in the Slots3 collection, you’ll find Rook’s Revenge at many online casinos we recommend highly here at OnlinePokieGame.com, with venues supporting multiple currencies and desktop, mobile and tablet play. Our favourite BetSoft casinos are all recommended in the casino table at the top of this page – use our links to sign up for an account and you can claim some excellent new player welcome bonuses when depositing real money for the first time. Two of the world's leading online casino software developers have launched brand-new online pokies games for June 2018.